Another generous helping of free Titanfall 2 content is on its way later this month, publisher EA has announced. A Glitch in the Frontier is due to arrive April 25 on Xbox One, PlayStation 4 and PC, bringing with it new additions to every major facet of gameplay. The first port of call are the new maps being added to mix up the action. Glitch and Deck are their names, and you can get a visual tour of both by way of the above trailer. Glitch is a medium-sized map set on the planet Harmony and promotes objective-based play, according to the blog post. Long, winding paths and vertical drops promise to provide plenty of opportunities for Pilots to gain the upper hand over the enemy team as well as evade death at the hands of opposing Titans. Deck, on the other hand, has been built from the ground up especially for Live Fire mode, so expect a much more intimate affair for this war zone. Cramped interiors and exposed courtyards will force you to quickly adapt on the fly rather than allow any breathing room. As for other content being crammed into the update, developer Respawn says it’s making several changes to the main menu in order to make it more visually appealing as well as adding new Gen icons for player callsigns. These will be awarded for each 10 gens achieved, for which the cap has been raised to 100. A new execution move – Get to the Point – is also bundled in along with a new option that lets you choose between both regular and Prime executions for Titans. That’s it as far as April’s concerned, but don’t expect Titanfall 2‘s slew of free content to end anytime soon. 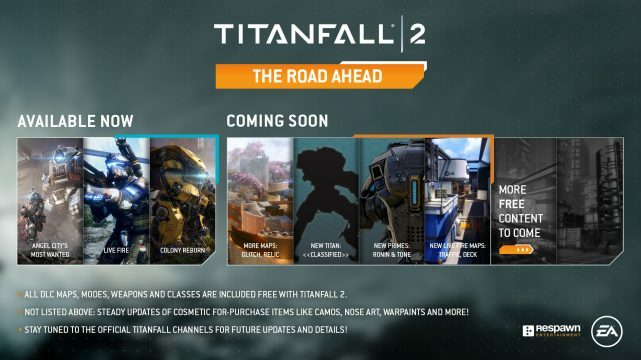 A brand new Titan, as well as Prime versions of Ronin and Tone, additional maps and more, are all due to roll out before the end of June. See the roadmap below. Respawn and EA continues to set the bar for delivering high quality, completely free DLC. With another EA-published game, Star Wars Battlefront II, due out this year, can we expect to see a similar method of content delivery used for the shooter? We’ll have to wait and see.